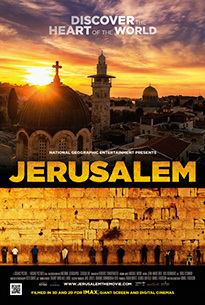 On 25 February, the Ontario Science Centre held a media premiere for the National Geographic IMAX film Jerusalem. Writer, producer, and director Daniel Ferguson attended the event along with surprise guests Farah Ammouri, Nadia Tadros, and Revital Zacharie, the three stars of the film. The day consisted of a special viewing for media and students from nearby schools, and a Q&A session followed by a press conference and select private interviews. The documentary is centred around three young girls: Farah Ammouri, Nadia Tadros, and Revital Zacharie, who tells us what it is like to live in Jerusalem. Farah represents the Muslim quarter, Nadia represents the Christian quarter, and Revital represents the Jewish quarter. Each girl takes the film crew through the city to places that are religiously important to them and talk about how their faith influences their daily lives. Narrated by Benedict Cumberbatch, the film gives an overview of the three religions and the origins of their holiest places—Judaism’s Western Wall, Christianity’s Church of the Holy Sepulchre, and Islam’s Dome of the Rock. Granted permission to film aerial shots for the first time in twenty-five years, the crew captured images of the city and landscapes that are absolutely breathtaking and transport the viewer to the very heart of Israel. After the screening, the Q&A session with the director began. When Daniel Ferguson stepped on stage he said, “Before you ask your questions, I have a question for you. If you could ask the girls in the film anything, what would you ask?” A child raised her hand and quietly asked a question. Instead of answering it himself, Ferguson told the audience we would have the opportunity to ask the girls themselves questions. Farah, Nadia, and Revital walked on stage—the crowd broke out into loud applause. The children in the audience eagerly asked questions, such as, “Are you friends now?” The girls answered that even though they had only been together twice in person, they considered themselves as friends. The girls were well-spoken and composed and easily became the centre of attention for the students. Ferguson received his share of questions afterwards during the press conference. Both he and the girls made up a panel along with Dr. Hooley McLaughlin, Vice-President of the Science Centre. The panel answered a number of questions about technical work, casting the stars, and the rights to film in certain places. The girls were asked about the place of women in what mainstream media sees as male-dominated cultures (they unanimously agreed that women are more important in their cultures than is portrayed by the media) and why they had joined the project. The girls and Ferguson shared the same reasons: they wished to show what life in Jerusalem, behind all the politics, is really like. They wanted to inspire people to find out more about Jerusalem—or even visit it. Most of all, they hoped to forge a connection between these three faiths that live in such close proximity in Jerusalem—that these neighbours will not just walk by each other but be able to interact on a daily basis regardless of their faiths and their differences. Jerusalem had a large impact on me personally. Although I am familiar with the history of desire and bloodshed behind this Holy City, I had never really considered how people live there now. I was surprised the environment isn’t hostile. Knowing that so many was have been fought due to their differences, I assumed a city with more than three different religious groups would have difficulties living alongside each other. And while there are difficulties, they are not violent or hostile—but social issues between the different cultures. The fact that the religious sects opened their doors to Ferguson and his crew shows they are not unsociable—perhaps just unaware: a situation I think could be easily fixed with a little education about the beliefs and practices of the communities around them. Jerusalem may be the first step. The information in the film is limited by its 43-minute run time—but the story did its job. The film has awoken a desire in me to know more about this mysterious city and hopefully see it for myself one day.